These treks apart from having continuous trekking stretches are at tricky places, which might require assistance from trip leader/guide and other staff people. All these treks have rest days in between. Also all of them involve crossing passes or areas having altitude of more than 4500m. Veterans are mostly preferred for such treks. Garhwal region of Uttrakhand located very near to the Himalayan Peaks, gives lots of scope for most-adventurous and enjoyable trekking experiences to trek-lovers. 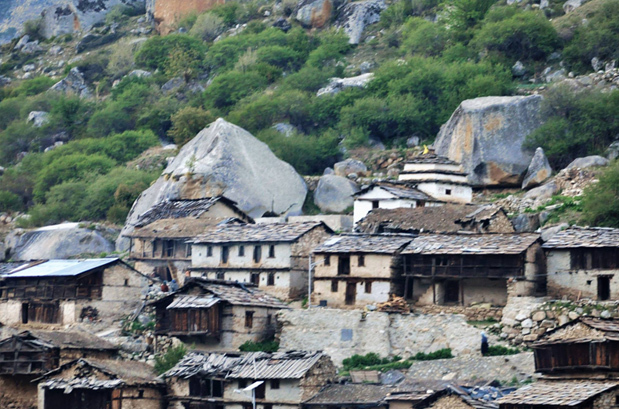 The Kanari Khal Trek stands out of the crowd by its fascinating excitements. 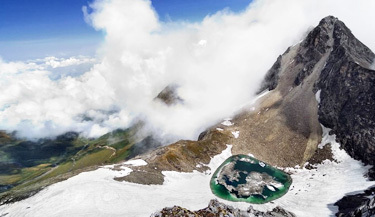 What is in store for trekkers here is high altitude of 4150 meters above sea-level; viewing the snow-clad peaks in closer proximity; rivers; streams; waterfalls; thick forests; eye-pleasing grass-lands; wild-flowers-laid carpets and peaceful tiny mountain villages en-route. Historically people of India have been making it a wow in their life, to visit Badrinath and Kedarnath on pilgrimage tour, located in this region. Badrinath Yatra should go through Joshimath; and Kanari Khal Trek is an enjoyable diversion for trekking from Joshimath. The trekking trip starts from Joshimath and reaching a small village by Jumma, by truck on a hilly and bumpy road, and rides through the villages Tapovan, Reni, Lata, Suraithota and Phagti, alongside of the River Dhauliganga. This village Jumma is close to the Indian-Tibet border, and so the winds blowing will be fierce and very chill. The actual trekking starts from a steel-bridge over Dhauliganga; ascending 3 kms to Ruing and you will be staying for the night. From here further ascending to Dronagiri; Longatulli; (taking a side-attraction trip to Bagini Glacier) Kanari Khal and Garpak to return back to Jumma again. Now the excitement and thrilling experiences, while passing each stop of this Kanari Khal Trek are for your information. Ruing to Dronagiri trail is well-laid and goes through a forest. So you can enjoy the surrounding of greenery, singing of birds and wildlife creatures passing your way. The main-route to Dronagiri is ascending and ticklish, but there is also a descending trail going through a hilly-terrain. Once you cross this trail carefully, what awaits you at the top will be breathtaking view of Hathi Parvat and Ghori Parvat. Fully snow-clad in winter, these two peaks look like arising from a beautiful painting. During summer, blooming flower-beds are added attraction all over. Camping at Dronagiri will be mind-pleasing, since high-technology equipments of Solar panel lighting and Satellite Phones are available. There is also temple here for Bhumial God. You can have a glimpse of Mount Dunagiri from here. Trekking from Dronagiri to Longatulli is somewhat easier, because the trail is not that steep. On the way, you can view at long-distance Rishi Peak and Bagini Nala. The area is devoid of vegetation and looks barren. After two hours of expedition, you will see a stream and green-patches of fertility. 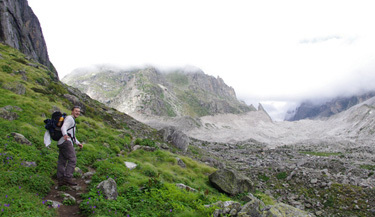 Most trekkers spend one more day at Longatulli to climb the trail to Bagini Glacier. When you reach Bagini Lower Base Camp at 12,360 feet, you can happily view the Hardeol, Satminal and Rishi Pahar Peaks standing majestically. Continuing the trail you will reach Bagini Glacier – also known as Garud Base Camp, to enjoy viewing the beautiful Himalayan Peaks fully-covered with snow. The trail from Longatulli to Kanari Khal will be steep and narrow. Tall grass grown everywhere and you can see Bagini River gushing down below. Reaching Kanari Khal you will feel on top of the world, and view the amazing Dunagiri and other peaks, as well as Nandi Kund Pass at a distance. Then descend down to Garpak, back to Jumma and Joshimath; and take the fond memories of Kanari Khal Trek with you back home! Best time to travel to Kanari Khal Trek is in summers (May – June) and Post Monsoon (September – mid October). 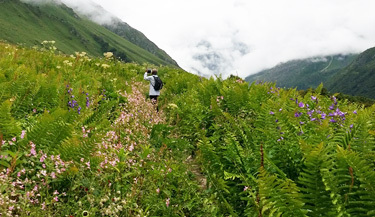 Summer: The weather of Kanari Khal Trek remains salubrious and pleasing during summers. The Himalayas are distinctly visible and the cool breeze adds charm to the vacation. Carry woolens with you. Post Monsoon: Serenity and solitude are at its best during post monsoon at Kanari Khal Trek. The region is blessed with snowfall during winters and the accommodation options also remain few. But you can see the best of Kanari Khal Trek during post monsoon as it looks like Heaven on earth. Where is the Kanari Khal? Standing tall amid the bounties of nature, Kanari Khal is a high mountain Pass in the Chamoli District of Uttrakhand. The trek is not meant for faint hearted people. Usually, mountain lovers and adventure seekers are seen scaling the Kanari Khal. From Kanari Khal, one can see the view of Dunagari and other neighbouring peaks. Today in the morning, we shall board Dehradun Shatabdi Train from New Delhi Railway Station at 06:55 hrs for Haridwar. Arrival at Haridwar by 11:20 hrs. On arrival, meet our representative who will assist you to Rudraprayag. Lunch will be provided on the way. Arrival at Rudraprayag by evening. Check-in to the hotel for overnight stay. In the morning after the breakfast, we will drive to Joshimath via Karnprayag, Nandprayag and Chamoli. On arrival at Joshimath, check-in to a hotel. The day is kept free for relaxing. In the evening, we shall hold a meeting to discuss the trek. Dinner and overnight stay at the hotel. Post breakfast, we shall drive to Jumma and from here our first day trek will start. Today, we will walk to Dronagiri village via Ruing and Chiyacha. We will cross dense forest, flowering meadow and shall pass by few waterfalls. On arrival, we will set out a camp for an overnight stay. Today, after the breakfast, we will trek to Bagni Bamak via Dronagiri Col and Dronagiri Gad. The day is likely to be full of excitement and adventure. We will cross giant boulders and the huge glaciers. On arrival at the base, we will set up our camp for an overnight stay. The day is for relaxing and exploration of the surroundings. Overnight in the camp. In the morning, we will trek down to Dronagiri Village. Dinner and overnight stay in camps. 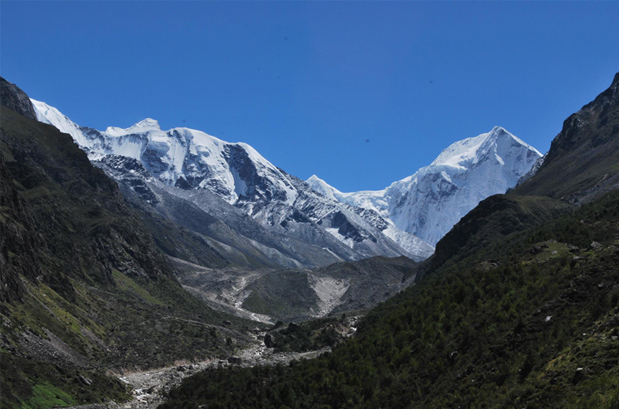 Today, we will head out for the challenging trek to Kanari Khal (4515 mts). We shall traverse through high passes, waterfalls, a thick forest, a high altitude meadow and a few streams. We will set out our camp just before the Pass for an overnight stay. In the morning today, we will trek up to Garpak village. 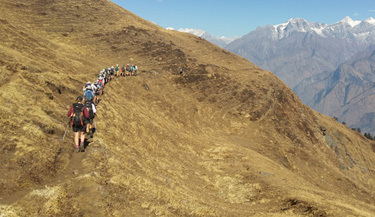 The trek requires trekking ascending on a steep terrain after the Pass. Dinner and overnight stay in camps. Today, we will trek up to Kalla Khal Base. The trek is a mix of ascends and descends, which means it will be an arduous stretch. On arrival, we shall set out our camp for an overnight stay. We will trek to Malari Today. It is a beautiful border village in the Niti Valley. We have to we will cross River Dhauli Ganga. On arrival, we will set up our camp for the overnight stay. In the morning, we will drive to Rudraprayag via Jumma, Lata, Reni, Tapovan village and Joshimath. One can take a holy dip in hot water spring at Tapovan. Upon arrival, check in the hotel for an overnight stay. In the morning drive to Haridwar via Devprayag and take an AC train to Delhi by 18:05 hrs. Arrival at Delhi by 22:45 hrs. When to book Kanari Khal Trek? You should book Kanari Khal Trek well in advance (at least 2 month prior) advance so that you get ample amount of time to prepare well for the trek. There will be pony/porter that will carry your backpack while on trek; you only need to carry your small knapsack. 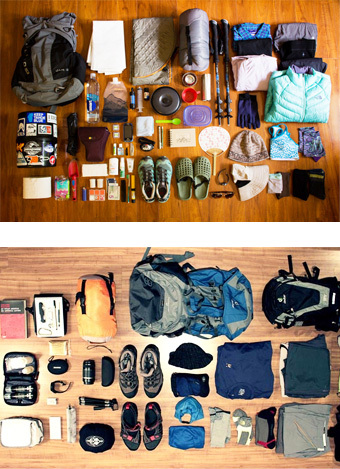 Once you book your trek with us we will give you a list of things to carry and the total weight should not cross 12 Kgs. Our pick up and drop point for Kanari Khal Trek is New Delhi train station at platform no. 16. We will send you the train ticket and you can board train from there to Haridwar. At Haridwar our guide will pick you from train station and then from there your tour will start. 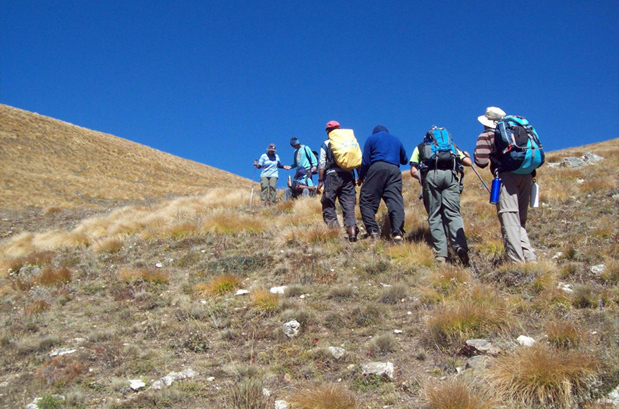 We always have an experience trekking guide who leads the trek. Our group size is minimum 4 people and maximum 12 people with mix of men and women. What is minimum age required for Kanari Khal Trek? Kanari Khal Trek is a challenging trek with a maximum altitude of 14810ft (4515m) minimum age required is 18 years. What will be the minimum temperature during Kanari Khal Trek? In the month of May & June the temperature during the trek can go as low as 2 Degree Celsius during the night and September – Mid October also in minus by night and morning which will further decrease the temperature. How long we trek during Kanari Khal Trek ? We plan our treks in such a way that after 6-8 hours of trekking we reach next camp in between 14:00 – 15:00 hrs time and normally trek a distance of 10-15 Kms a day. If we have to extend the trek because of the reasons which beyond our control then additional charge may apply which are of hotel stay and food. Diamox is indeed very helpful, but it's advisable to consult the doctor first. Yes, it is a safe trek for girls. Different shoes are suitable for different kinds of treks, depending on the weather, trail condition as well as duration of the trek. For warm and dry terrains, you can choose low-ankle hiking shoes. Trek boots are best for the rugged and cold condition. Trekking on the glaciers and extensive snow, on the other hand, will require trek boots with crampon-ready features. Any footwear brand that provides ankle support and comes with crampon-ready features is considered as the best for trekking. While trekking, we serve vegetarian food rich in protein, carbohydrates and highly nutritious. Sometimes, we surprise our trekkers with tasty treats like pakora, local food, etc. Vehicles like Mahindra Bolero, Tata Sumo, Scorpio, Max, and Tempo Traveller are suitable for a ride on damaged Himalayan roads. We guarantee that even if that there will one trekker we will go on that date. How do you deal with the emergency situation? Trekking on high Himalayan altitudes is always a rewarding experience. However, it is important that you should keep your safety in mind. Emergencies, like illness, AMS, storms, missteps, landslides and even avalanches, are rare but can happen anytime during the trekking, so be prepared for any random goof-ups. To deal with any emergencies your guides, who are an expert mountaineers will be there for your rescue. Your tour guide will always carry a first aid kit to deal with any medical emergencies. In the case of some rescue operation, extra charges will be borne by the trekkers. Register for the trek and we will send you the details about the booking procedure.